The country's leading automaker Maruti Suzuki has unveiled a limited edition variant of their best seller Maruti Suzuki Swift in both petrol and diesel variant. Priced at Rs 6.34 lacs for the diesel and Rs 5.45 lacs for the petrol version (all prices, ex-showroom Delhi), it is placed between the LXi/LDi base models and the VXi/VDi variants. 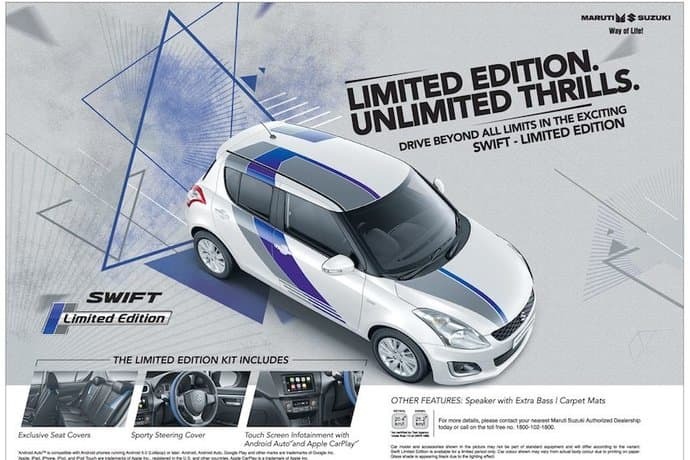 The limited edition Maruti Suzuki Swift hatchback comes with a bunch of exteriors and interior cosmetic enhancements along with new feature upgrades as compared to the regular model. The exterior changes feature new sporty looking blue and grey decals on the door, roof and bonnet. Carrying out the same theme to the interiors, the cabin gets new seat upholstery, carpet mats and steering wheel wrap matching the mood of the exterior color. Also for the first time, the Swift lineup gets the new infotainment system with connectivity support for Car Play and Android Auto as seen on the Baleno, Ignis, and S-Cross. Under the hood, there are no mechanical changes as the limited edition comes with the same 1.2-liter petrol or 1.3-litre diesel engine. The petrol variant churns out 83bhp of power and 115 Nm of torque while the diesel version manages 74bhp of power and 190Nm of peak torque with both being paired with a standard five-speed manual transmission gearbox. With the next-gen Maruti Suzuki Swift expected to be unveiled at the Auto Expo 2018 in February, this limited edition launch comes as a surprise to everyone waiting for the new model. This launch can be seen as a clever move from Maruti Suzuki to clear out the existing stocks of the old model, making way for the upcoming 2018 edition. The 2018 edition is expected to take the already immensely popular swift to a new level by packing it with better materials, more equipment and newer engines with improved fuel efficiency. So are you getting the new limited edition Swift or will patiently wait for the 2018 model? Let us know in the comments below.